Welcome to Shiflet Field (9A9) in Marion, NC. Directions to Airport from I-40: Take exit 85 for US-221 0.2 mi. Turn left onto US-221 N 1.8 mi. Continue onto N Carolina 226 N/US-221 BUS N/Rutherford Rd 1.9 mi. Slight right onto N Carolina 226 N/US-221 BUS N/S Main St 2.1 mi. Turn right onto Creek St 246 ft. Turn left onto Garden Creek Rd 0.2 mi. Take the 1st right onto Holly St 0.5 mi. Continue straight onto Airport Rd 1.1 mi. Fuel is only available to members. Contact a member on the field if you are a transient and in urgent need of fuel. Transients may park in an unoccupied tiedown on the Northwest side of the runway or in the grassy area in front of the fuel pump along the benches. Please leave your name and telephone number inside the airplane on the glareshield in case we need to contact you. 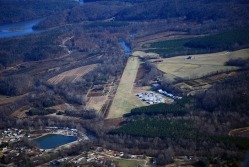 The airport is maintained by the members and there is no transient tiedown fee, but donations are gratefully accepted by mail to the Marion Airport Commission, PO Box 1298, Marion, NC 28752.